As the guardian of the gate, Maxim's orders are simple. He must track down the princess and bring her home. But then the ancient portal is suddenly destroyed, leaving Maxim and Sabine trapped on the other side, and he quickly realizes that if he is going to keep the beautiful, headstrong princess safe, he is going to have to take her firmly in hand and teach her to obey. Sabine is shocked to learn that under the laws of this realm, she will not be a free woman. She will be a pet, the property of her owner, and that owner will be Maxim. Soon enough, she is wearing nothing but a collar and tail as she kneels at her master's feet with her cheeks blushing and her well-punished bottom sore both inside and out. But when the gate is repaired and opened once more, will Maxim and Sabine end up at the center of a war between two worlds? 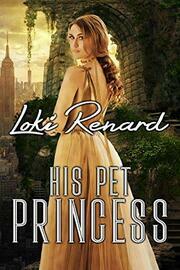 Publisher's Note: His Pet Princess includes spankings and sexual scenes. If such material offends you, please don't buy this book.